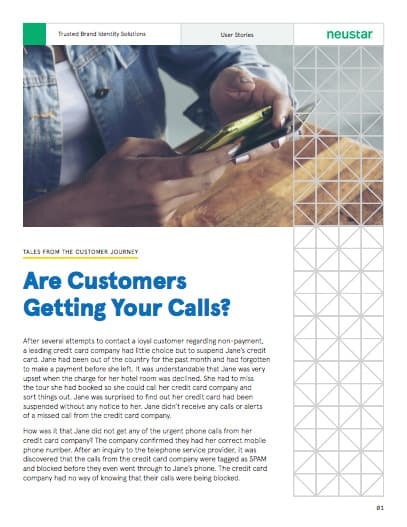 Are Customers Getting Your Calls? After several attempts to contact a loyal customer regarding non-payment, a leading credit card company had little choice but to suspend Jane’s credit card. Jane had been out of the country for the past month and had forgotten to make a payment before she left. It was understandable that Jane was very upset when the charge for her hotel room was declined. She had to miss the tour she had booked so she could call her credit card company and sort things out. Jane was surprised to find out her credit card had been suspended without any notice to her. Jane didn’t receive any calls or alerts of a missed call from the credit card company. How was it that Jane did not get any of the urgent phone calls from her credit card company? The company confirmed they had her correct mobile phone number. After an inquiry to the telephone service provider, it was discovered that the calls from the credit card company were tagged as SPAM and blocked before they even went through to Jane’s phone. The credit card company had no way of knowing that their calls were being blocked. With the dramatic rise in illegal robocalling and phone scams, telecom service providers have been permitted by the Federal Communications Commission (FCC) to block certain types of calls before they reach customers. Calls are being blocked that appear to be fraudulent based on the number from where they originate. But legitimate business calls are potentially being blocked. In this situation, the business was unaware that the call was blocked, and the consumer was unaware that the call was even attempted. Why Does This Moment Matter? Being able to talk to customers to resolve issues when “life happens” is a vital part of building long-term relationships to retain loyal customers. The first step to preventing inadvertent call blocking and spam-tagging is to add business phone numbers to an authoritative whitelist of phone numbers being used for outbound calling. In addition, businesses can ensure their numbers are not being used for illegal robocalling by updating authoritative blacklists with inbound-only Do-Not-Originate (DNO) numbers. It’s also important for businesses to deliver accurate and consistent outbound caller identity to create a richer call experience. This helps their customers avoid fraudulent calls while ensuring they answer those important calls they don’t want to miss.